The weekly icec data for Nov 6 2005 to Feb 26 2006 had "zeros" instead of "missing" over land. Please reacquire those files. Weekly means from 1981/10/29 to 1989/12/28. Weekly means from 1989/12/31 to 2019/04/14 . Monthly means from 1981/12 to 2019/03 . Long term monthly means, derived from data for years 1961 - 1990. Long term monthly means, derived from data for years 1971 - 2000. The Physical Sciences Division has collected and made available in (COARDS and CF-1.0 compliant) netCDF files, the weekly, monthly NOAA OI SST V2 data and monthly long-term mean from NCEP (Y. Xue) based on the V2 data. The optimum interpolation (OI) sea surface temperature (SST) analysis is produced weekly on a one-degree grid. The analysis uses in situ and satellite SST's plus SST's simulated by sea-ice cover. Before the analysis is computed, the satellite data is adjusted for biases using the method of Reynolds (1988) and Reynolds and Marsico (1993). The dates used in the netCDF files are the dates of the beginning of the 7-day average period. For the more recent period, 1990-present, the weeks are defined to be centered on Wednesday. During the period 1981-1989, the weeks are centered on Sunday. The latitude/longitude values in the netCDF coordinate variables are the centers of the grid cells. The ice field shows the weekly median ice concentration values input to the SST analysis. Ice concentration is stored as the percentage of area covered. For the ice fields, the land and coast have been set to the netCDF missing value. Note, the ice land mask is a function of the ice analysis and may change periodically. The OI analysis is done over all ocean areas and the Great Lakes. There is no analysis over land. The land values are filled by a Cressman interpolation to produce a complete grid for possible interpolation to other grids. The ocean and land areas are defined by a land sea mask (the lsmask.nc file). Land values for sst do not necessarily coincide with land values from ice analysis. The NOAA OI.v2 SST monthly fields are derived by a linear interpolation of the weekly optimum interpolation (OI) version 2 fields to daily fields then averaging the daily values over a month. The monthly fields are in the same format and spatial resolution as the weekly fields. The ice field shows the approximate monthly average of the ice concentration values input to the SST analysis. Ice concentration is stored as the percentage of area covered. For the ice fields, the land and coast grid cells have been set to the netCDF missing value. A climatology based on these fields was derived by Yan Xue of the NCEP Climate Prediction Center following the technique of Reynolds and Smith (1995) and Smith and Reynolds (1998). The climatologies are available here in the sst.ltm. *.nc files and include 1961-1990 and 1971-2000. See the references for details on how the climatologies were calculated. For more information see http://www.emc.ncep.noaa.gov/research/cmb/sst_analysis/. The current weekly means are generally one week behind the current date. PSD standard NetCDF 55 Mbyte file for each weekly 1981-1989 file (packed). PSD standard NetCDF >110 Mbyte file for each weekly 1990-present file (packed). PSD standard NetCDF >38 Mbyte file for each monthly file (packed). PSD standard NetCDF 2 Mbyte file for each LTM file (packed). PSD standard NetCDF 133 Kbyte file for each mask file. Missing data is flagged with a value of 32767s. Land and coast set to missing for ice fields. SST land areas can be masked using the lsmask.nc file. Please note: If you acquire NOAA_OI_SST_V2 data products from PSD, we ask that you acknowledge us in your use of the data. 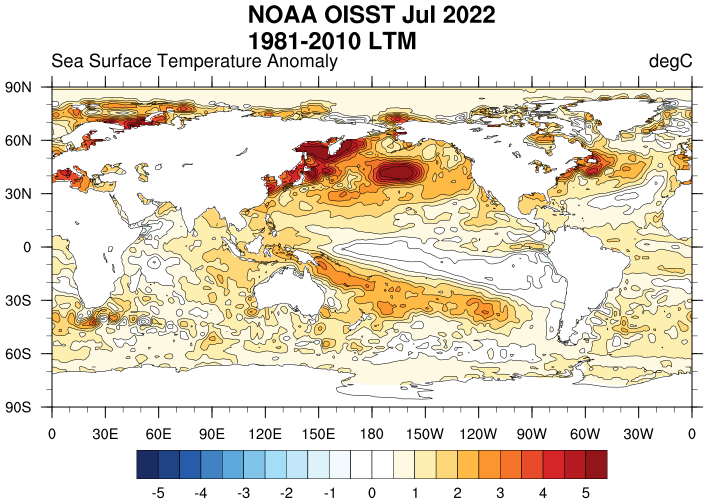 This may be done by including text such as NOAA_OI_SST_V2 data provided by the NOAA/OAR/ESRL PSD, Boulder, Colorado, USA, from their Web site at https://www.esrl.noaa.gov/psd/ in any documents or publications using these data. We would also appreciate receiving a copy of the relevant publications. This will help PSD to justify keeping the NOAA_OI_SST_V2 data set freely available online in the future. Thank you!